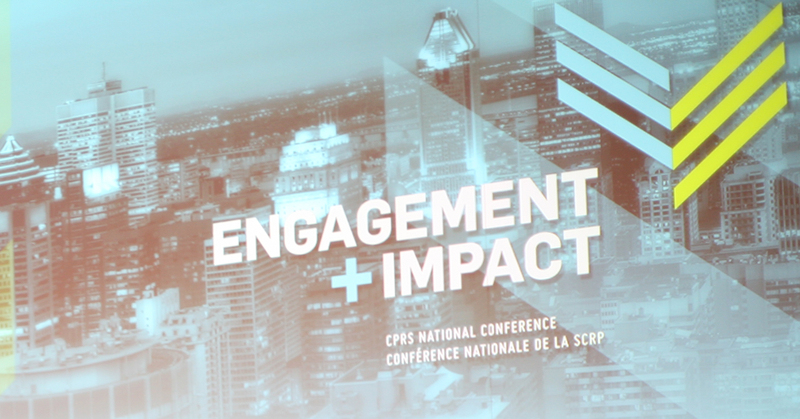 The Canadian Public Relations Society’s annual conference, Engagement and Impact, wrapped up yesterday in Montreal after three days of TK-CONTENT for PR and communications professionals. Earlier this week we covered the highlights of the keynotes on Sunday. Here are the biggest takeaways from days two and three of the conference, which featured conversations about giving back to the community, managing change and communicating fairly. In Monday’s most engaged keynote address, Canadian Olympian Alexandre Bilodeau, shared his experiences becoming a press darling after winning a gold medal in the 2014 Vancouver Winter Games. The skier emphasized that you should build partnerships that align with your personal or company values, have the potential to be long-term relationship, and are mutually beneficial. After Bilodeau’s presentation, National PR shared its analysis of more than 20,000 comments and articles written by Canadians on Reddit. The team found that the number of conversations centering around the fairness of a subject grew from 10 per cent in 2013 to 80 per cent last year. use standard practices to communicate it to the community Brands have flip the format and listen to the public’s perception on issues and use them to build a program that fits within its values and community. An example of this is how while a company may donate a great deal to charity, it will be criticized heavily for low wages or for lay offs. On Monday afternoon, Mike Van Soelen the managing principal of National PR, built off of Jaime Watt’s keynote from the day earlier about the right to reputational consultation. Van Soelen compared the Lac Magantic train disaster of 2013 and Maple Leaf Foods listeriosis contamination of 2008. In both situations, executives stepped out in front of the media, but while Maple Leaf Foods was able to ride the storm, the RMCP held The Montreal, Maine and Atlantic Railway (MMA) responsible for the disaster ultimately leading to its bankruptcy. Maple Leaf Foods survived by being transparent, prepared and timely in its response to the disaster. Meanwhile MMA, was vilified in social media and on editorial boards, for appearing poorly prepared, by attempting to divert blame and failed to even speak provide statements in French, the language predominantly spoken by the community affected. President of Versailles Communication Guy Versailles shared his experiences volunteering his services as a communicator to a children’s wellness organization in Tunisia. He advised attendees to find opportunities to give back to the global community as more than a corporate strategy, but for personal development and fulfillment—which inevitably spills over into professional development. Fine-tune your execution. Donald Beauchamp, senior vice-president of communications for the Montreal Canadiens, delivered the conference’s final keynote yesterday discussing how he manages PR for one of the most popular National Hockey League teams. While securing coverage for the team isn’t a challenge given it’s notoriety and expertise, ‘managing hundreds of reporters, hockey players and coaches in order to execute he coverage is a struggle. His strategy? Remain focused on the basics of public relations: building relationships both internally and externally. He also shared that in crisis, or when the team has major news, his communications team strives to stay ahead of the media so he can control the message and reduce the amount of response required.